“You’re making a big mistake here.” TV Land has released a new trailer for season two of Impastor. 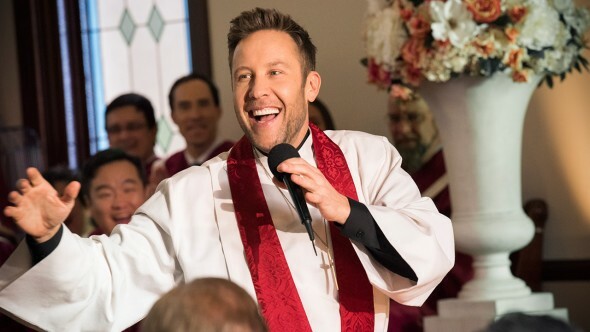 The comedy stars Michael Rosenbaum as Buddy Dobbs, a gambler who winds up posing as the new pastor of a small-town church. Sara Rue, Aimee Garcia, Mircea Monroe, Mike Kosinski, and David Rasche also star. Season two of Impastor premieres on September 28th at 10:30 p.m. ET/PT. What do you think? Have you seen Impastor? Will you watch season two? More about: Impastor, Impastor: canceled or renewed?, TV Land TV shows: canceled or renewed? You need to cancel this show. Small children watch this channel, and I thought it was a family channel. This is a stupid and nasty show. It has sensitive material which children should not hear or see! YAY! Im sooo jazzed! Coulda swore it had been cancelled. Now if only the suits at Comedy Central would bring back Larry Wilmores show!